Don't let this shot fool you. The Samsung ATIV Q is also a tablet. The first thing I look for when reading about new Windows 8 devices is the pen support. The newly announced Samsung ATIV Q includes an S Pen with 1,024 degrees of pressure sensitivity. Check. Then I check for screen size and resolution. 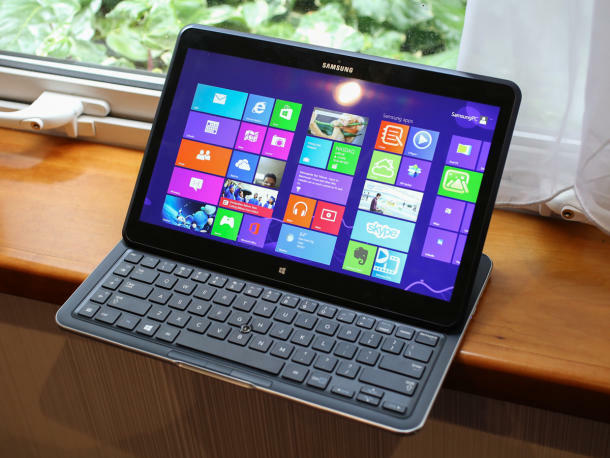 For example, Samsung's ATIV Tab 3 is 10.1 inches and 1,366 x 768. Fail. But the ATIV Q? A capacious 13.3-inches and 3,200 x 1,800 resolution! Gulp. Lastly, I look at the processor and battery time. Intel Haswell i5 with 9-hours of battery life! Check and mate. To make matters even more interesting, the ATIV Q is a dual-OS device that allows you to switch instantly between Windows 8 and Android 4.2. Nice. And last but not least, the included low-profile keyboard tucks into the back of the device when you don't need it. Amazing design. No word yet on availability and price, but my Surface Pro may be on the market soon. At the very least, Samsung may force me to start up the companion url I registered when I launched this blog: WinTabArtist.com. Stay tuned!